Our basic soap with a herbal blend of essential oils. 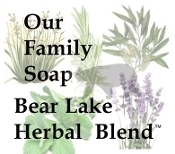 Named for the popular vacation site, Bear Lake, Michican, it is a great soap for camping or any day of the week. Fresh scent with a overtones of lavender, lemongrass, peppermint. The combination of essential oils is known to discourage flying and biting insects without harming additives and harsh smell. Also known to possibly help with various skin conditions. Coco butter makes your skin feel so soft.